It shouldn’t be surprising that the Caribbean is different. It’s clear across the continent from the resorts of the Pacific side. 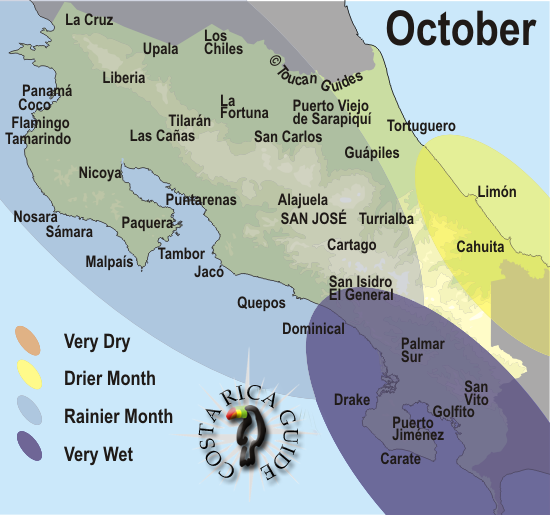 Costa Rica October weather patterns. October is one of the rainiest months on the west coast and one of the driest on the east. A good time to visit the Caribbean. Just as the southern Caribbean follows the beat of a different, Reggae drummer it has different weather patterns than the rest of the country. The official rainy season in Costa Rica is from May through November with the most rainfall in September and October, but this is not the case in the southern Caribbean. The two wettest months in the rest of the country are two of the driest sunniest months around Puerto Viejo, Cahuita and Manzanillo. Conversely as the rest of the country is drying out in December and January the rains are intensifying in this region. If you’re looking for beach weather during the U.S., Canadian and European fall months, your best bet in Costa Rica is to head east to the coast and then south. There are no huge beach resorts on the east side of Costa Rica. It is possible to visit the southern Carib from the comfort of a five star air conditioned all inclusive suite, complete with multiple swimming pools, swim up bars, and world class spa services but you have to bring it with you. Luxury liner cruise ships dock at Limón weekly.